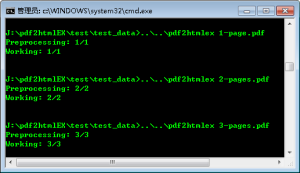 After some modification, win32 static version pdf2htmlEX has been compiled with the help of MXE under Ubuntu. It has only one pdf2htmlEX.exe and a data folder, others are optional, for example, readme, changelog, license and so on. support windows temp directory,mkdtemp bases on the modified version of mktemp. only tested under windows 64-bit system(tried all the example offered by the author, all successful). to download software, please visit here. 2 Responses to "pdf2htmlEX v0.9 Windows Verion Release"